White is the new black, especially when it comes to marine tanks it seems. 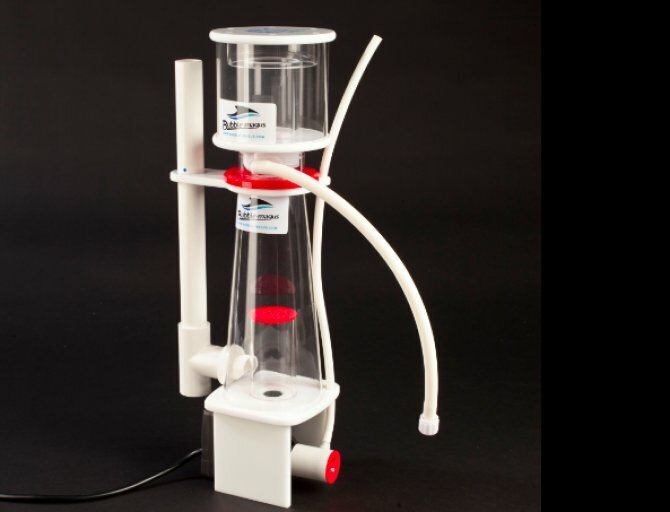 Nathan Hill takes a look at a new protein skimmer that's following this colour trend. If I’m honest, I have no idea what NAC stands for — nor do I have the first clue what the 3.5 refers to. The Bubble Magus website does little to help, as it looks as though it’s been translated 300 different times through every programme available. Eventually the text ends up looking like something that just resembles English. So, is the product any good? It looks lovely in white, which seems to be the big thing for marine tanks right now, but ironic as we spend most of our time trying to hide gear in sumps and weirs. It’s elegantly simple. Unlike some skimmers I’ve played with, there are no fiddly little settings, nor small parts to fall off that I might later choke on. Rather than elaborate lash-ons to the Venturi inlet, the skimmer uses a dedicated needle design impeller, thrashing bubbles down to the appropriate size. Flow is controlled by a simple twist of the upright return pipe in an action that doesn’t work loose or adjust itself over time. Depending on your source, the skimmer claims to be good for between 100-300 l/22-66 gal of water and really is quite the compact lump. I love the fact that it’s almost bulletproof, as I’ve kicked, knocked and dropped mine and it’s not taken so much as a nick. The pump sits at the base, which is great for space saving, but could be fitted a little tighter. It seems to choose just the wrong moment to drop out and splash water or knock glass sumps. Having so few working parts this is easy to maintain and the inside of the fractionation chamber can be cleaned without any bother, using some long-handled brushes. The package is complete and there’s nothing to replace on it, unless you count the impeller which may eventually give up through wear and tear. In a hobby so prone to adding unnecessary tweaks to hardware, this is refreshingly basic and well worth the price. Price: £153.60 (full RRP), replacement impeller £11.99. Available in the UK from J and K aquatics.